 The management of strand flash materials has been a headache for serious fly tiers, but not any more!  By utilizing powerful magnet dots and steel-core wraps, you can easily keep 15 hanks of strand materials, all ready for instant access.  The Tool Foam spins for easy access to tools that you need.  Temporary Hanger is for finished flies and material storage. 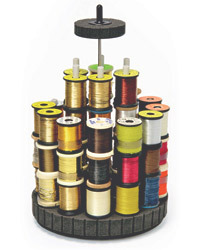  Thread spools can be stored on three Bobbin Shafts.  Tools and materials NOT included. 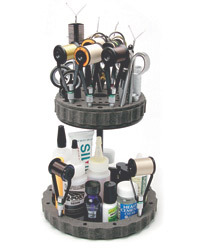  Using this double-decker tool caddy, organise your tying tools, chemicals and glues. 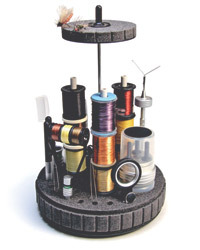  Occupies minimal space on the tying desk.  Designed to accept almost any bobbins on the market. Rotate the foam to select the bobbin you need. 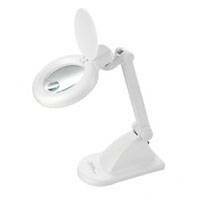  Can hold up to 60 bobbins. Temporary Hanger on top is a small but great addition to keep finished flies and materials in use. 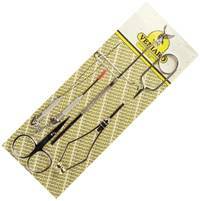 This handy kit comes packaged in a ripple foam fly box and includes 7 fly tying tools! A small fly box with ripple foam inserts and accessories. 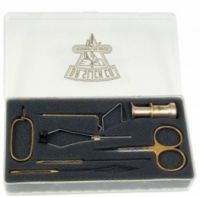 A beautifully engineered fly tying tool set. Comes in its own case with cut foam to hold everything in place. 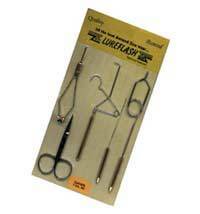 Contains a Loop clamp, Dubbing Needle, MP Pliers, MP Twister, Whip Finish Tool and Small Scissor. 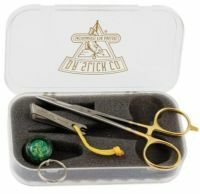 The same as the fly tying set above but with the addition of a pair of long scissors. 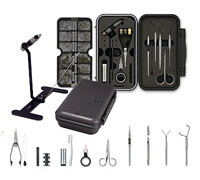 Marco Polo Fly Tying System is the mobile kit for traveling fly fisherman. However, we made no compromise. All tools are full size and easy to use, but engineered to fit compactly into our Waterproof Case. The whole system fits into the Waterproof Case supplied.